No-one likes to think that the worst could happen, but sometimes it does. In the event of a road traffic accident, there is a very real danger that an improperly secured water tank could break free and kill or seriously injure the driver and passengers. Ionic went to extraordinary lengths to make sure that your safety isn’t compromised should you be unfortunate enough to be involved in a road traffic accident. We developed our systems so that they will stay firmly anchored to the vehicle in the event of a collision. But don’t just take our word for it! 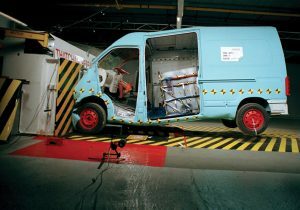 We commissioned an independent crash-testing program at the vehicle testing center Thatcham Research. Ionic Systems remain the ONLY supplier of water-fed pole equipment to be awarded the FMVSS-208 certification. 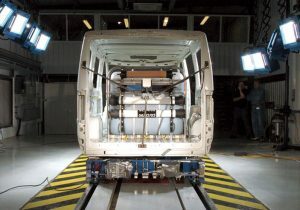 In order to meet the FMVSS-208 standard, several development tests were conducted on Thatcham’s Hyper-G reverse acceleration sled. Sled tests are particularly useful for highlighting potential weaknesses, but only with an 100% impact test can you be sure how the machine will perform in a real crash. Following the development tests with the Hyper-G Sled, two 100% impact barrier tests were carried out at 30mph Only with a real 100% impact could we be sure how our machines would perform in a real crash. Click Here to See the 100% Impact Tests. Thatcham Research is an internationally respected vehicle crash-testing and research center. Based in the South of England, Thatcham’s extensive facilities allow for many different types of vehicle safety and impact testing. Thatcham is the center of choice for most Insurance companies.